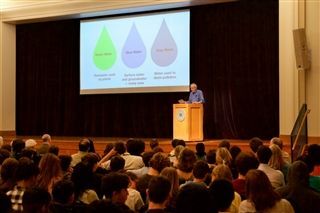 Vanderbilt professor George Hornberger spoke to High School students about the impacts of population growth and even food consumption on the Earth’s limited consumable water supply. Hornberger discussed the implications of urbanization, population growth, and food consumption on the water supply, as well as how people can be mindful of their water usage. Students learned about the ways in which the study of water is multifaceted, not only involving environmental awareness, but also an understanding of geography, socio-economic structures, and social sciences. Students had the opportunity to ask Hornberger their own questions about the research demonstrating the concern for water supply presently and in the future, as well as ways in which they can take part in the solution. The Buhl Lecture Series began at USN in 2001 to honor the intellectual vitality of the late Arthur H. “Mike” Buhl, an esteemed USN faculty member. 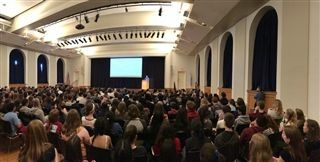 The purpose of the annual lecture is to honor Buhl’s commitment to a life of the mind and to inspire intellectual discourse among our High School students and faculty. George Hornberger on the Auditorium stage during the annual Buhl Lecture.